One never likes to cheer a breakup, even if the pair was wrong for each other from the get-go, and even if the pair deeply, habitually wounded one another. A breakup is a failure. It's pathetic. It's time wasted, and we have so little of it on this earth. 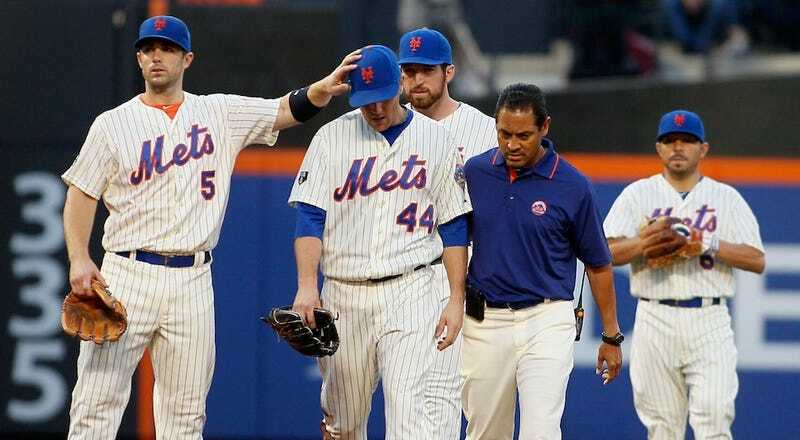 But holy mother of god, yes, yes, Boxing Day has come early—the Mets are ditching Jason Bay! The Mets announced in a statement that they have reached an agreement with Bay to terminate his contract two years early, granting Bay unconditional free agency. When Bay arrived, before the 2010 season, he was general manager Omar Minaya's last desperate patch for an aborted dynasty that had aged far too quickly. After 2009, the Mets were reeling: injuries to Carlos Delgado, Jose Reyes, and Carlos Beltran made it clear that the roster was crumbling, the Madoff mess had made it clear that the owners had very little money, and the construction and opening of Citi Field had made it clear that the team had insufficient business and aesthetic sense. What was the solution? Ah, of course: Throw $66 million over four years to a right-handed power-hitting corner outfielder, the kind of player who declines rapidly with age. Bay's contract soon became one of the cool albatrosses that aided the Mets to successively worse records in 2011 and 2012 and kept them from re-signing Jose Reyes after last season. He came back the next year and looked even worse: .245/.329/.374, with 12 homers but fewer doubles and only one triple. A late-season hot streak after the team had given up was the only thing that kept his OPS out of the .600s. And Bay played in favor of better options: Scott Hairston, Mike Baxter, and Nick Evans outhit him (by averages) while earning the league minimum, yet they sat. And then there was this year, 2012. Bay showed up and struggled. Then he hurt his rib. (In his place, Scott Hairston flourished, mind you: in 398 plate appearances last year, Scott Hairston hit 20 home runs. The Scott Hairston.) Then Bay came back, and his average dipped to .187 before he concussed himself and spent another month on the DL. When he returned in mid-July, no Mets fan wanted him around, but the team played him anyway. He started more often than not, and, outside of one glorious grand slam against Mark Buehrle, put together what must be the most depressing season of any former three-time all-star. He hit .165/.237/.299. He could do nothing, even while platooned—that is to say, put in theoretically advantageous situations. He had lost all of his baseball ability. But Bay should not be reviled, like Oliver Perez, the cowardly thief. Watching Bay, especially in 2012, I felt for him, less because of his struggles than because he truly seemed to be stuck doing something he really didn't want to do. He had had his brains scrambled by head injuries. He looked pale and gaunt, a misfit inpatient among the suntanned, built Mets. (Yes, even the Mets are suntanned and built.) He still dove for balls, because he wasn't quitting in the way quitters usually quit but in the way poor souls do. This reading of Bay from afar jibes with today's news. The Mets said late last year that they wouldn't eat Bay's contract. But today, he's leaving by mutual agreement. They didn't call it a buyout. One imagines Bay left some guaranteed money on the table. Bay said in a statement today that he feels he still has "plenty to give to this game," and that he still "can play baseball at a high level." Maybe he does and maybe he can. Either way: we're glad Bay realized there are better places to answer those questions than in front of Citi's sparse, wronged crowds.